When Stefan Schmidt (vocals, guitar) isn't promoting the a cappella metal band Van Canto, he's directing his Heavatar project. 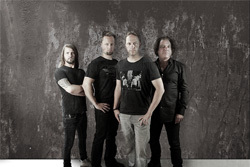 Schmidt and Heavatar gain inspiration from classical music composers to create their melodic heavy power metal. Or as Schmidt has asked, "What would it sound like, if Beethoven, Mozart, Chopin, and friends joined a metal band?" We will find out with their latest creation Opus II - The Annihilation. Or perhaps not. We only have Schmidt's word. Apparently Puccini informs the chords of None Shall Sleep. The small piano opening to Hijacked By Unicorns (great song title by the way) is from Chopin to create a heavy metal shuffle. If there is any recognizable reference to a great classical composer it comes with the title track, The Annihilation where Heavatar steals the distinctive opening from Beethoven's fifth symphony. Then Schmidt adds that ideas come from Mendelssohn, Boellmann, and Vivaldi. But what these musical ideas are and where they appear are not all that obvious. With songs such as A Broken Taboo, A Battle Against All Hope, and the lighter An Awakening, Heavatar adds a basic synth symphonic layer to give the songs a "classical" feel. With A Battle Against All Hope you may notice a stronger "violin" presence. For pure classical symphonics, there's an orchestral version of A Look Inside as a bonus track. Additionally, with Metal Daze, Heavatar does a cover of that great classical composer Manowar. 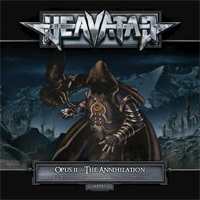 But all said, Heavatar's Opus II - The Annihilation merely sounds like traditional heavy/power metal with a touch of symphonic and classical nuances. There's nothing new there, but it does sound rather epic. All said, Heavatar's Opus II - The Annihilation merely sounds like traditional heavy/power metal with a touch of symphonic and classical nuances. There's nothing new there, but it does sound rather epic.